On the way to Peach Sangria, I made Peach Simple Syrup, which was so peachy good that I’ll be making it all over again for some summery cocktails and a peach cake! 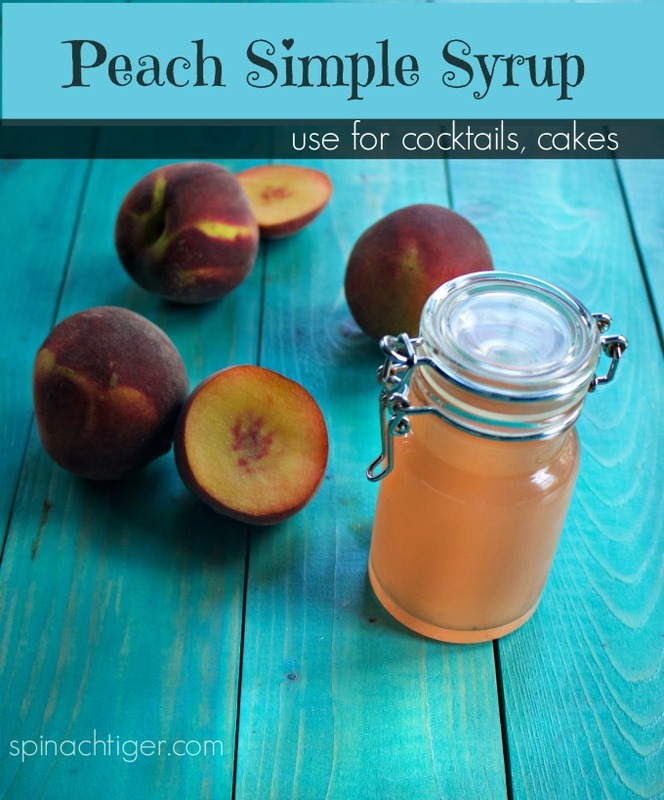 Use Peach Simple Syrup for cocktails, drinks, teas, cakes. I like to take flavored simple syrup and brush in on cake that comes out of the oven. My most popular simple syrup is a strawberry simple syrup which people use for cocktails like the strawberrysangria. It all started with my desire for a refreshing Peach Sangria. 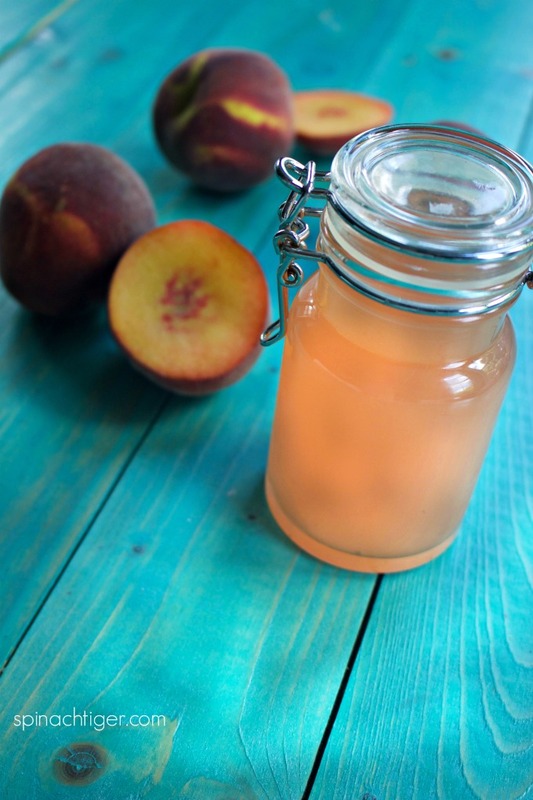 Peach Simple syrup will turn my favorite winter drink (an old fashioned) into a summery splash. 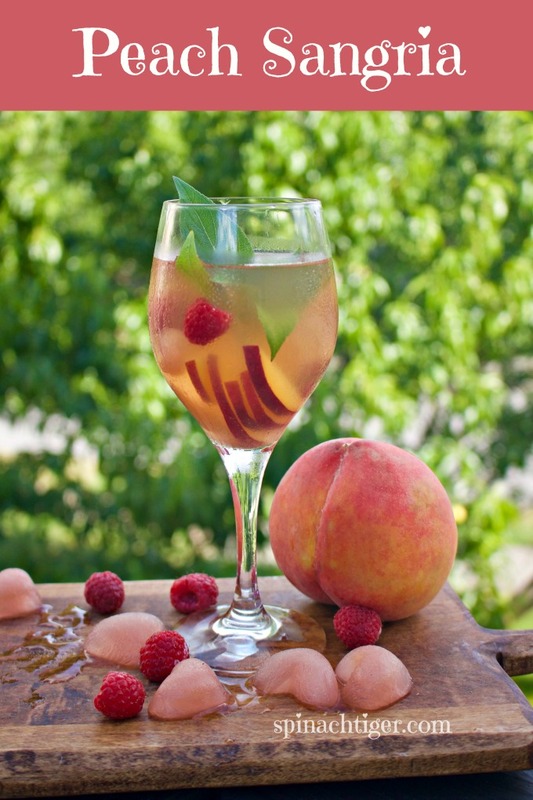 The key to peach sangria is ripe peaches, which aids to extra flavor and sweetness. Typically, for a simple syrup I use a one to one ratio, meaning one cup sugar to one cup water. If I’m making it sugar free using a powdered erythritol, I use one cup water with about 1/2 cup of the of Swerve. I give you recipes for both. I add in one peach per one cup water, but it must be a very ripe peach. I cut the peach in half and squeeze in the juice and place the remaining peach, skins and seed. Bring to boil and then simmer for about 30 minutes. It will reduce, thicken and gain flavor. It’s ready for cocktails or baking. You can play around by adding in fresh herbs at the end and allowing them to seep for ten minutes. Basil works well, but this year I found lemon basil and lime basil, which are currently growing in my garden and are so nice for garnishing. Cool and store in refrigerator in jars like these. (affiliate). If I’m using this for drinks, I’ll take some of it to make ice cubes. Disclosure: This site has affiliate links which earn a small commission, but does not increase prices. 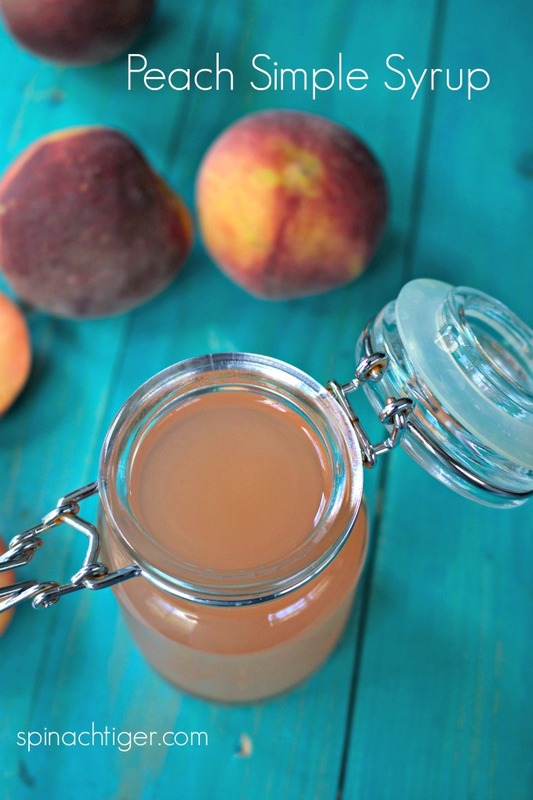 Peach Simple Syrup, easy and so good for cocktails or baking. 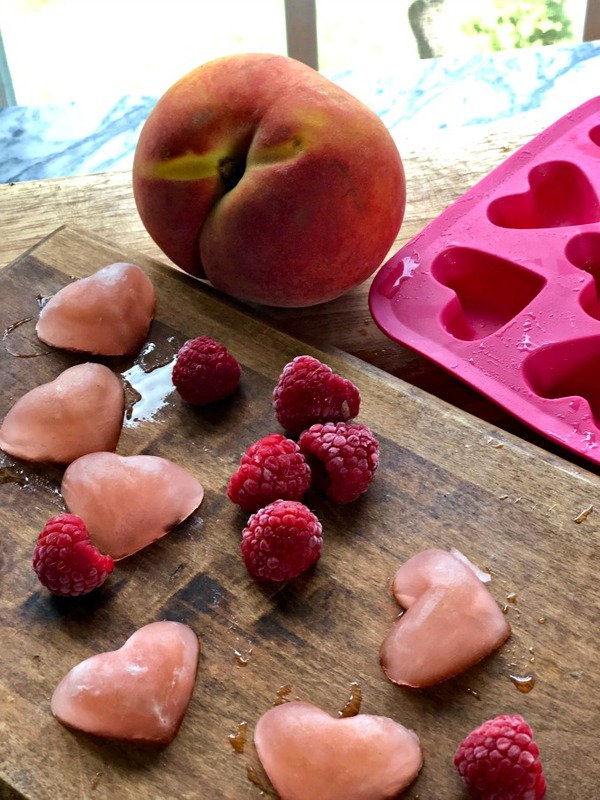 Cut peaches in half and squeeze juice into the water. Put all remaining parts of peach and sugar into the water. Bring to boil. As the fruit is heating up, smash with fork to extract more flavor. Simmer for 30 minutes until thick and flavorful. Remove the fruit, strain, Cool. Store in refrigerator in mason jar. You can cut this recipe in half, but I make double to make ice cubes.